In 2013-14, Alexey Shved's point production (four per game) was cut by more than half from last season, when he played in all but five games and started 16. This is the first in a 14-part series evaluating each Timberwolves player’s performance during the 2013-14 season. Alexey Shved means well. His effort level is unquestionable. But it’s become clear after two seasons the 25-year-old Russian isn’t quite NBA-ready yet. Hoped to provide a spark off the bench and play some meaningful minutes at both guard spots, Shved instead exhibited such streakiness and lack of offensive discipline that coach Rick Adelman was forced to stop giving him as many chances to prove himself. Sometimes, he’d come in and hit a couple big shots or make a nifty pass that got him going. Often, he’d flail wildly at anything he thought could impress his coach, teammates and the fans watching him. 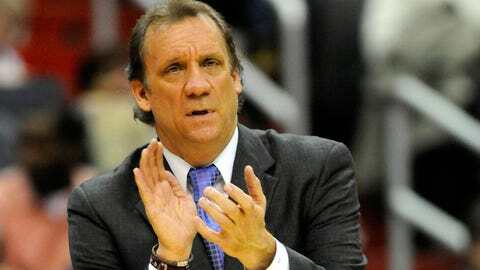 A "frenzy," Adelman called it. With a technically sound stroke when he’s not rushed and a willingness to attack the rim, it was thought Shved could become an auxiliary scorer in the NBA. 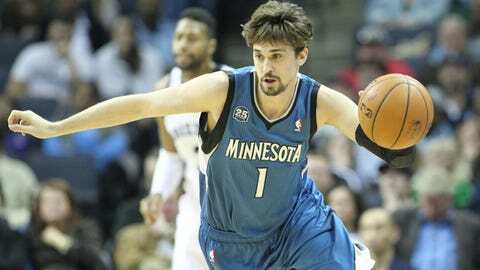 But in his second season since coming over from Russia as an undrafted free agent, Shved was anything but. His point production (four per game) was cut by more than half from last season, when he played in all but five games and started 16 due to injuries, drawing some rookie of the year conversation early in the year. But the flashes he showed then weren’t in nearly enough abundance this season; he shot 32.1 percent from the field and hit double digits ten times all season. There were times, including an impressive spot-duty performance April 9 against Chicago, when Shved calmed himself enough to survey defenses and initiate Adelman’s offense, rather than simply take the first shot available. More comfortable as a point guard than the two-guard he was asked to be more frequently, Shved averaged 4.9 assists per 48 minutes, good for third on the team among players who averaged more than 10 minutes per game. But more often than not, Shved’s desire to make an offensive impact caused him to go off script and try to do things all by himself. A key for Shved’s development will be his ability to channel the overabundant energy he exhibits on offense into pesky defense on the other end of the floor. Effective scoring and passing requires calm, finesse-based execution, whereas defense is an outlet for a player to put forth as much effort as possible without the fear of losing the ball. Shved can become an effective defender, given his high motor and 6-foot-6 frame, but he’s not there yet. The oft-melancholy Shved, whose teammates constantly say needs to smile more, didn’t have much reason to grin in 2013-14. Adelman desperately tried to convert him into a second-unit contributor, but to no avail. There are physical tools present, but Shved has yet to discern how to combine them into a skill set becoming of an NBA basketball player. Timberwolves president of basketball operations Flip Saunders may consider buying out the final year of Shved’s contract, worth a little less than $4 million, or see if he can glean some return in some type of trade — provided he can convince another general manager he’s worth it.